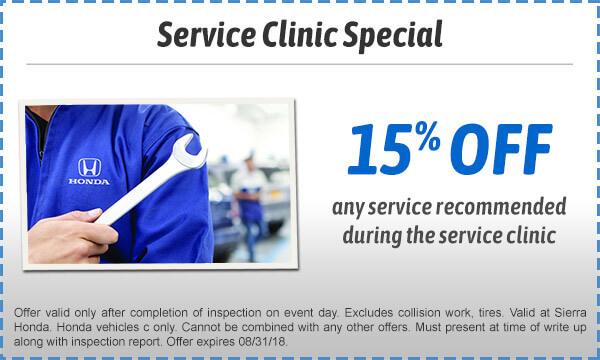 We are happy to inform you that our team at Sierra Honda is inviting you to a Customer Appreciation Service Clinic where you will receive a complimentary inspection. At your convenience, on Thursday, August 23rd, from 4:00 p.m. to 8:00 p.m., our factory trained technicians will be available, by appointment, to provide you with this complimentary service. After the vehicle inspection, our service team will go over the results with you and suggest preventative maintenance that your vehicle may need in the future. Your vehicle evaluation will take approximately 30 minutes. Schedule your complimentary Certified Service Inspection below. For same day appointments please call for the most accurate availability. Thank you!